Sometimes you just get lucky. Graduate students Laura Briere and Jared Chastain, along with their faculty adviser, historian Orlan Svingen, were in College Park, Maryland, last spring looking for information about the storied 161st Infantry Regiment when they stepped off the elevator on the wrong floor. It turned out to be a fortunate mistake. They’d hoped to find old photographs and other paper documents from the Washington National Guard regiment’s World War II deployment but stumbled onto something even more dramatic. Specifically, an old film reel containing never-before-publicly viewed footage of the unit’s fierce, island-by-island march across the Pacific. They came away with so much more. The research project on the 161st, a unit that can trace its roots to Washington’s pre-statehood days as a territorial militia, represents the most thorough examination of its World War II service ever compiled. The regiment’s success in the Pacific Theater would come to be seen as a global message about the combat readiness of America’s citizen volunteers. The 250-page manuscript, written by Briere, also includes photos, maps and other illustrations to help readers better understand the dynamics of the era. Everything from community reaction to the regiment’s activation to the battlefield recollections of the soldiers who were there is included. The researchers compiled so much they decided to experiment with other communication platforms as well. Chastain, who also is working on a master’s degree in history, used a combination of photos and film footage, including several minutes from the newly discovered reel, to produce a 15-minute documentary. It includes a soundtrack and details about the unit, its role and the war itself to tell the story of the 161st in music, images and words. At the Maryland archive complex, Chastain remembers seeing some VHS cassettes along with the film reel in a box. The archivist told them that when production companies want old war footage for television documentaries, programs or movies, the original film gets converted to VHS. Finding a film canister still tucked away in a box meant the footage had yet to be examined and converted. They also produced an audio podcast version of the full report for those who would rather listen than read it cover to cover. Something the students learned quickly is that the activation of the 161st was considered a community event as neighbors, friends and family members reported for duty. Not only did communities organize morale-boosting sendoffs, they continued to support the 161st with care packages from home, and letters from soldiers overseas became widely read updates in local newspapers. Company E of the 161st was based in Pullman and many of the soldiers were students at Washington State who put their college studies on hold when the unit was activated. Among them was Edwin G. Park, who returned to Washington State after the war to finish his studies and whose continuing support of his alma mater made the history project possible. During her research, Briere noticed that studying global politics through the experiences of a single military regiment provided a more personalized understanding of world-changing events. The 161st learned about the Japanese attack on Pearl Harbor, for example, while aboard a troop train headed to San Francisco in preparation for what was supposed to be deployment to the Philippines. They instead were diverted to Hawaii to bolster defenses against a potential invasion after a series of sometimes conflicting and rapidly changing orders in the hectic week following the surprise attack. It wasn’t until the Japanese defeat at Midway Island in 1942 that the U.S. shifted to an offensive military posture in the Pacific. The 161st was key to the Allied strategy, capturing airfields and other strategic assets across the Pacific in a series of tough battles that took a heavy toll. Back home, newspapers reported on developments large and small, from photos of smiling soldiers on leave in Honolulu to poems and songs written about military life in the South Pacific. French, affectionately known as “the Skipper” among his troops, distinguished himself in combat as well. The 161st was sent to the Solomon Islands in the summer of 1943. After helping take Guadalcanal, the unit was dispatched to aid in the capture of nearby Munda airfield as part of an effort to deprive Japanese forces of strategic points they’d been using to stage combat operations against U.S. and Allied positions. In reports and personal letters, soldiers described the fight for Munda airfield as worse than the battles at Guadalcanal. The airfield was flanked by a series of hills that had to be taken one by one. French was wounded in a July 24 attack but bandaged his injured right hand and held his ground. He suffered a shrapnel wound to his left hand two days later and bandaged that up, too. Portions of the 161st were tasked with helping clear Japanese forces from a stronghold known as Bartley’s Ridge that prevented the Allies from capturing the final hilltop overlooking the airfield, and French wasn’t the kind of leader who directed battles from the rear. As a historian, Briere knew the Allies would succeed in capturing Munda airfield. It was one of the key victories in the Solomons campaign. But she also knew something else about that fight. It’s kind of like a historian’s curse, knowing how a story ends as it’s unfolding. She’d seen French’s name before. It’s on the veteran’s war memorial on the WSU Pullman campus, and there’s a theater named after him at Camp Murray in western Washington. Three months after his Hawaiian romance was featured in his hometown paper, French was killed in action at Bartley’s Ridge as he directed a combined tank and infantry attack on Japanese positions while wounded. 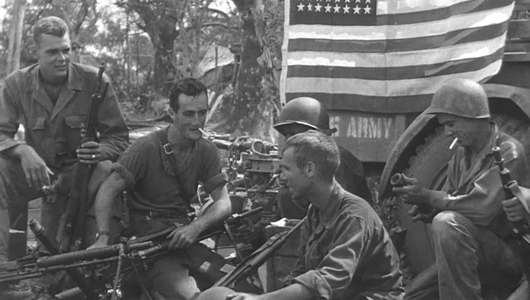 Top photo: a screen shot from archival film of the 161st Infantry regiment during World War II.